"Yellow dwarf" redirects here. For the fairy tale by Madame d'Aulnoy, see The Yellow Dwarf. The Sun, a typical example of a G-type main-sequence star. A G-type main-sequence star (Spectral type: G-V), often (and imprecisely) called a yellow dwarf, or G dwarf star, is a main-sequence star (luminosity class V) of spectral type G. Such a star has about 0.84 to 1.15 solar masses and surface temperature of between 5,300 and 6,000 K., Tables VII, VIII. Like other main-sequence stars, a G-type main-sequence star is converting the element hydrogen to helium in its core by means of nuclear fusion. 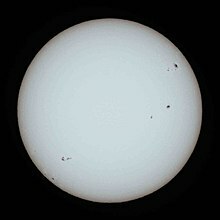 The Sun, the star to which the Earth is gravitationally bound in the Solar System and the object with the largest apparent magnitude, is an example of a G-type main-sequence star (G2V type). Each second, the Sun fuses approximately 600 million tons of hydrogen to helium, converting about 4 million tons of matter to energy. Besides the Sun, other well-known examples of G-type main-sequence stars include Alpha Centauri A, Tau Ceti, and 51 Pegasi. The term yellow dwarf is a misnomer, because G-type stars actually range in color from white, for more luminous types like the Sun, to only very slightly yellow for the less massive and luminous G-type main-sequence stars. The Sun is in fact white, and its spectrum peaks in blue and green light, but it can often appear yellow, orange or red through Earth's atmosphere due to atmospheric Rayleigh scattering, especially at sunrise and sunset. In addition, although the term "dwarf" is used to contrast yellow main-sequence stars from giant stars, yellow dwarfs like the Sun outshine 90% of the stars in the Milky Way (which are largely much dimmer orange dwarfs, red dwarfs, and white dwarfs, the last being a stellar remnant). A G-type main-sequence star will fuse hydrogen from a few billion years to approximately 20 billion years, until it is exhausted at the center of the star. For example a star like the Sun will live on the main sequence for 10 billion years. When this happens, the star expands to many times its previous size and becomes a red giant, such as Aldebaran (or Alpha Tauri). Eventually the red giant sheds its outer layers of gas, which become a planetary nebula, while the core rapidly cools and contracts into a compact, dense white dwarf. The revised Yerkes Atlas system (Johnson & Morgan 1953) listed 11 G-type dwarf spectral standard stars; however, not all of these have survived to this day as standards. The "anchor points" of the MK spectral classification system among the G-type main-sequence dwarf stars, i.e. those standard stars that have remained unchanged over years, are beta CVn (G0V), the Sun (G2V), Kappa1 Ceti (G5V), 61 Ursae Majoris (G8V). Other primary MK standard stars include HD 115043 (G1V) and 16 Cygni B (G3V). The choices of G4 and G6 dwarf standards have changed slightly over the years among expert classifiers, but often-used examples include 70 Virginis (G4V) and 82 Eridani (G8V). There are not yet any generally agreed upon G7V and G9V standards. Some of the nearest G-type stars known to have planets include the Sun, 61 Virginis, HD 102365, HD 147513, 47 Ursae Majoris, Mu Arae, Tau Ceti and Alpha Centauri. ^ Empirical bolometric corrections for the main-sequence, G. M. H. J. Habets and J. R. W. Heintze, Astronomy and Astrophysics Supplement 46 (November 1981), pp. 193–237. ^ a b Stellar Evolution: Main Sequence to Giant[permanent dead link], class notes, Astronomy 101, Valparaiso University, accessed on line June 19, 2007. ^ Why Does The Sun Shine?, lecture, Barbara Ryden, Astronomy 162, Ohio State University, accessed on line June 19, 2007. ^ Sun Archived 2007-06-16 at the Wayback Machine, entry at ARICNS, accessed June 19, 2007. ^ Alpha Centauri A, SIMBAD query result. Accessed on line December 4, 2007. ^ Tau Ceti, SIMBAD query result. Accessed on line December 4, 2007. ^ 51 Pegasi, SIMBAD query result. Accessed on line December 4, 2007. ^ Cain, Frazer. "WHAT COLOR IS THE SUN?". Universe Today. ^ "What Color is the Sun?". Stanford University. ^ Dissanaike, George (19 October 1991). "Painting the sky red". New Scientist. 132 (1791): 31–33. ^ SIMBAD, entry for Aldebaran, accessed on line June 19, 2007. ^ The Perkins Catalog of Revised MK Types for the Cooler Stars, P.C. Keenan & R.C McNeil, "Astrophysical Journal Supplement Series" 71 (October 1989), pp. 245–266. This page was last edited on 6 April 2019, at 00:24 (UTC).